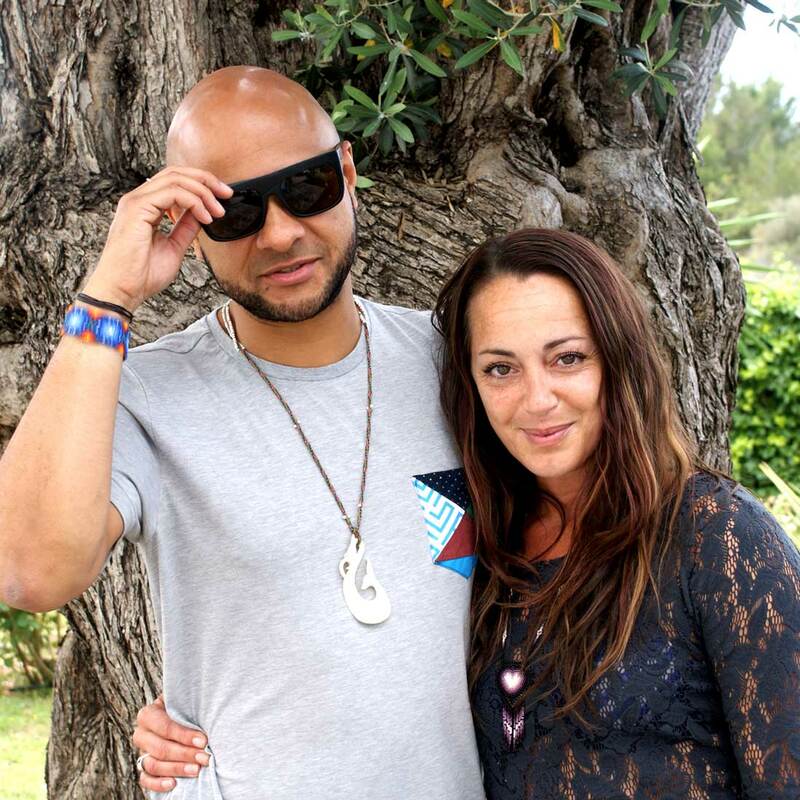 Interview with George Evelyn, Nightmares on Wax, and his wife Amanda, Hypnotherapist. Held in July 2014 at their home near Santa Gertrudis. Job Title: Hypnotherapist Age: 43 Home Town: Dirty Leeds. Your Current Work/Business. I’m a hypnotherapist. I help people with all kinds of things from smoking to issues in their past. Job Title/Position. Musician, Producer, DJ, Spiritual Conductor Age: 44 Home Town: Leeds, Leeds, Leeds Your Current Work/Business. I am the founder of Nightmares on Wax. I run Wax de Jam in Ibiza at Las Dalias and Wax de Beach at Kumharas. NG: Please tell us about your Ibiza journey. GE: My Ibiza journey started in 1988, the first time I could afford to book a flight. I came on holiday with a friend Kevin Harper. I didn’t know anything about Ibiza, I was DJing back in Leeds and people were telling me I should come here. It was a completely different experience to the Ibiza I know now. I was in San Antonio and ran out of money after 3 days. We lived on bread, chips and San Miguel. Then things started to take off back home and I came over to Ibiza again to do some gigs. I first came with Amanda in 1994. We didn’t really see the island until 1999. We thought we knew the island—but we didn’t. 1999 was a holiday. We stayed in an amazing villa with some friends and that was the first time we’d driven round and really got to know Ibiza. We’d been to Jamaica where my Dad is from and felt an affiliation there. The terrain here is very similar, and that was the first time we really fell in love with the island. We already loved what we knew of Ibiza for the parties, but that’s only 10% of the island. ‘99 changed our minds totally. AE: We moved here 8 years ago. We decided to come for a year first so we rented our house out in England, but as soon as we got here we knew it was for good. We packed everything up in England and never looked back. GE: We’ve lived here (a rural house off the Gerts to San Juan Road) for 3 years, for the first 5 we lived in Santa Gertrudis village. We thought we had our dream house in England, but then started to think what’s important, we want to be where the sun is, this is just bricks and mortar. NG: You don’t think it was just Leeds then? GE&AE: ha ha, cheek, yeah probably. AE: We’d lived in London and Brighton too, but it was the attitude in England. We didn’t want to bring family up there. NG: Do you have children? GE: Yeah, a 12 year old daughter Mali. She’s at San Lorenzo institute. AE: Her Spanish is great now, she’s really integrated. GE: She has friends from all over. Hangs out in the village at the weekends, English friends too, well from all over the world really. Definitely going to the local school has helped her integrate better. NG: How are you finding the 3 language system? GE: Well she went to Morna originally for 4 years. But we took a decision to go local. We felt it was too competitive. We’re council estate people, and the attitude we associated with private school growing up was starting to come through. We didn’t like that. Within 6 months of being in Gerts school she was integrated in the local community. AE: Within 6 months she was fluent Spanish, we’re really glad we took that decision. We don’t know what we’ll do for the last few years of her education but for now we’re really glad we took the decision. Now she teaches us Spanish. GE: The problem is we went into lessons which were ok, you’d do your homework, cover the syllabus, but then you’d get home and speak English. It is very easy to be lazy about it in Ibiza. The friends we have who speak Spanish well have all learnt it through being thrown in the deep end working in a bar or something like that. I think you need to practice all the time, day to day, to get good. NG: How have you found the other aspects of living in Ibiza, the domesticities and administration? GE: Administration, does that exist? It’s just one of those things. When we first got here doing all the residencia etc., was a pain. There’s always a form somebody has forgotten to tell you about. AE: It’s the price of paradise. NG: What you like to do in your downtime? Where would you spend a perfect family day? GE: At home! AE: It depends, like in the winter we tend to go out more. In the summer when it’s so busy everywhere we do tend to stay home a lot. We’ve got everything we want here, George has his studio and we’ve all got our own space. But when we do go out we like to go to Cala Martina, es Vedra. GE: A lot of it is because I travel so much, it is really good to get home and just relax. Cycling is good round here so we go out on the bikes. It’s a really good way to see the island, you get to lots of places you can’t reach by car. There is always somewhere to discover in Ibiza. It’s only 50kn x 40km but there are so many different worlds here, it’s what I love about the place. You have the tranquillity of where we are now but you can drive a few minutes and be amid absolute chaos. NG: What is your view on the way Ibiza has changed in recent years? GE: It’s interesting isn’t it. Though Ibiza is part of Spain and Spain is going through a really tough time, Ibiza seems to be in it’s own bubble. I think change is good. It’s seeing places like Playa D’en Bossa change, then like Benniras, I remember when it wasn’t even on the signposts and now everyone knows about it. Then there’s the VIP thing. I understand it, I get that it helps to fund the things that happen here, but I don’t feel segregation is a good thing. When we party we should party together. That’s where we come from. I understand it from a business point of view, but I don’t like it from a social point of view. It’s not just Ibiza though, it’s happening everywhere, it’s the MTV champagne table service thing, so why wouldn’t it happen here? NG: Ibiza has gone live in the last few years. Do you like that change? GE: I think it’s really good. When we moved here 8 years ago I couldn’t believe what wasn’t here. I thought it was a great opportunity, a blank canvas. That’s how Wax de Jam started with live musicians and of course Ibiza Rocks. I think it’s more important to have alternatives than anything. People need to be able to come here and have choice. Electronic music has had so many amazing happenings here, it is still very relevant, but I think alternatives are healthy. NG: Let’s talk about what you are doing professionally now. For the record I have a very good advertisement for Amanda’s skills in a friend who has been coming along to your hypnotherapy and is singing your praises—I’ve definitely noticed changes in him too. What’s your secret the Amanda? AE: I’m just really good at what I do (laughs). I’ve been working in hypnotherapy for 19 years and I’ve put my heart and soul into it. I think people can see that. I walk my talk, I’m a really good advertisement for myself (laughs some more). I’ve a successful business now and as well as private sessions I also do some group hypnosis and a bit of work on retreats. It’s all good. GE: Can I step in there for you. She is healing the world one person at a time. NG: What do you feel about hypnotism in an entertainment context? AE: When I was first training in 98 it was still very much getting the mickey taken. I had a couple of sessions myself and it changed my life. My teacher said to me “Amanda by the time we’ve finished you are going to be who you really are”. That really stuck with me. He helped me like I now help people. It can change people’s lives, from minor to major things, the actual experience, the relaxation, it’s a really powerful experience. NG: A stage hypnotherapist told me there are some people you can and some you can’t, do you agree with that? AE: There are some people who think they have not been, but though people may experience it in different ways there are no people I haven’t been able to hypnotise. It’s not what people think, they think you’re going to be in a trance from the moment they lay down in my chair. It’s a really peaceful relaxing experience, in that state people become quite open, it’s really therapeutic for body and mind so yeah there are people who think they will never be hypnotised, but those people are usually the ones that go the fastest. All hypnosis means is a deeply relaxed state. NG: Serious as it is the Alan Partridge and Phoenix Nights hypnotists were still hilarious right? AE: ha ha I loved them. They are my inspiration. NG: Thanks Amanda. George, you’re off to the states. (interview was before George’s US tour from which he has just returned). GE: We’re celebrating 25 years of Nightmares on Wax so this is like a ‘best of’ tour. It includes a lot of DJing but the main nuts of the tour is with the band so we’re going to the states for 4 or 5 weeks. All over East Coast, West Coast. We went last year too, not as big a tour as this one, this is the biggest tour we’ve ever done, but the last US tour went really well, 90% sell out. NG: What type of venues are you playing? GE: from around 700 to 1500/2000, New York, Brooklyn, San Francisco, L.A., a bit bigger than last time as it went well. It’s amazing what is happening over there. Although there are fans who have been with us all along, there are plenty of new fans too. In that way it feels like the beginning again, except this time I’m really glad I can remember everything. NG: Do you enjoy life on the road? GE: You know people ask that but to be honest I never get to see the road. You turn up at a venue, do your sound-check, have something to eat, do the show, load the gear, and then you get your head down before waking up at the next venue. It is a really humbling experience, to realise how far your music travels, y’know, it is an incredible feeling. It’s been emotional. NG: Can you give me an example of that? GE: Well like I remember somebody coming up and saying “I love your album” and I say how old are you? “I’m 22” well you were 7 when it came out “yeah my Dad introduced me to you”, it’s like wow! Another one was somebody telling me my music was their soundtrack to travel across South America, and a woman told me she had two kids to Nightmares on Wax. Stuff like that, it makes you feel really humble. I’ve welled up more than once. Making the music in the studio is one thing, but it’s only out on the road you really appreciate the affect it has had. NG: So do you sneak a bit of B-Boy in now and again? GE: When I’m drunk! Ha ha. We’ve done a box set to celebrate 25 years, within it there’s a book—history and memorabilia, and there’s pictures of me break-dancing in that, from 84/85. Last time I tried it I got up and couldn’t breathe. We loved it back in the day but I never thought of it in terms of being fit at all, I just loved it. I look back and think like, wow, I must have been super fit back then. NG: What after the States? GE: We’re doing a few shows in Europe, a festival in Greece. I like festivals as long as the weather is good. I really like the little festivals, the intimate ones, there’s always something special happens, a connection. Then some DJ dates but what I’m really excited about is Wax da Jam. We started the party at Aura. It was free, totally illegal so we couldn’t advertise, but it worked as was growing by word of mouth. 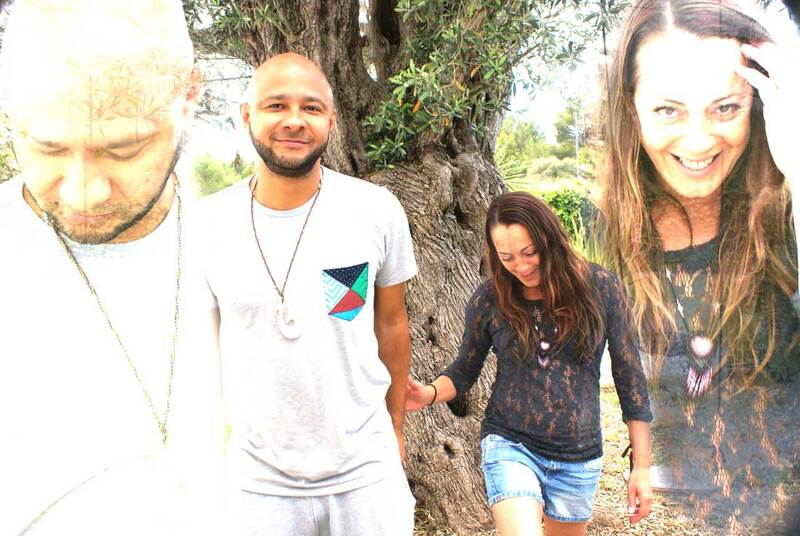 We then moved to Las Dalias and we start this year on Thursday 31st July and run til 18th September, we’re doing a full nightmares on wax performance every week. We’re doing it in conjunction with the Babylon Beach guys, and Dan Ward who has worked with me for longer than I care to remember, Dan was with the Acid Mondays. We’re doing a soul food kitchen up there, it’s gonna be a mini carnival every week, a community event. It’s still free if you come before 10pm. We’re having a community hour so local bands are invited to come along. Wax da Jam is about people, but we do want to up the production values which takes some investment so there are door charges to come in later, I think it’s like 10€ after 10 and 20€ after midnight, something like that. Las Dalias has got soul and history, I’m glad Vaughan at Babylon hooked us up. I think it’s good you have to travel to it too. It’s about getting out of your routine, getting away from your usual haunts and trying something different. That would be my message to people reading this. NG: Are you offering a lift? GE: Ha ha, I do understand it’s difficult to get about with the police and taxis so expensive, but I hope people will find a way. It’s the same with Kumharas, great food, great soul, but it is out of the way for people, but that seems to get the right people along. All challenges have a greater reward. NG: Is shovel connected to you? GE: Yeah, my brother from another mother. He was the best man at our wedding. NG: I really dig him. Our thanks to George and Amanda.